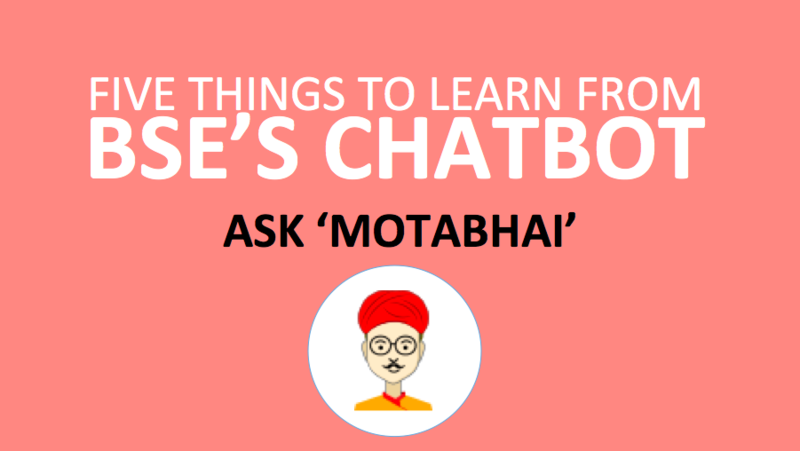 When most of the large organisations are still at an exploratory stage of adopting chatbots for their customers or employees, the launch of BSE Chatbot ‘Ask Motabhai’ is indeed inspiring. I have been meeting Business and HR leaders across large organisations during my presentations for our AI Platform. While I can see the curiosity around the AI hype and how AI can be used for business, the urgency is missing primarily due to the lack of clarity on its immediate and long term impact. 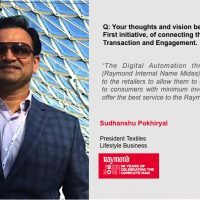 “I think BSE Chatbot ‘Ask Motabhai’ should inspire HR leaders and Business Heads for taking their first step towards an HR Chatbot for their employees and Brand Bots for their customers”. More often than not, many critical and future defining decisions in large organisations are not taken in right time because of lack of clarity on the first few steps. Often the cost of delay in such decisions is exponentially expensive than the cost of failure while trying out new things. Most of the time a simple first step helps us figure out the most complex trends and answers as we go along. Five Things to learn from BSE’s Chatbot initiative. 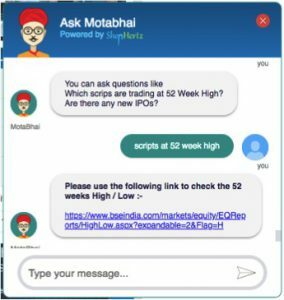 The BSE Chatbot is pretty basic, and mostly answers only structured and sequential questions. It lacks even basic level of NLP intelligence to understand conversational intents and works like key word based queries. But the fact that the organisation has decided to take first few steps towards adopting a future defining technology is indeed commendable. Taking the first step quickly, failing fast and improving faster is an open secret for creating competitive advantage in a world led by technology. More so, when a technology is new and you don’t have any experience or reference of how it will shape up, you have to start from somewhere, even if its a wrong start. As an expert in the Enterprise Chatbot Platform we are aware of the limitations of AI and Chatbots. However, it is also true that the intelligence of Chatbots are increasing by the day, due to exponential advancement in NLP and Machine Learning algorithms. To be honest, the BSE Chatbot lacks most of the easily available features and intelligence which are critical for the user experience. Its important to deliver the minimum expected value addition and experience to the users even in your first version, because the same user would interact with other smarter chatbots. 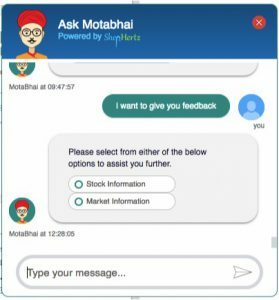 BSE Chatbot ‘Ask Motabhai’ only answers pre templated questions with structured responses. If the user does not follow the sequence and types in anything as a conversation, our ‘Motabhai’ gets confused and does not know what is being asked. These are simple things that can be easily addressed with a little expertise in NLP platforms. A. Personalisation – The Chatbot must have ML based personalisation feature to ensure that each time user interacts with the Chatbot, it understand the conversation pattern of the user and shows relevant suggestions. 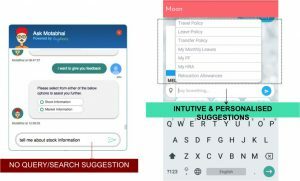 B. Query and Search Suggestions – The most critical feature for user experience and adoption for a conversational chatbot is personalised and intuitive suggestions, much like Google suggestions when you start typing anything. This makes the users understand what all can they ask and also eases the effort of typing the question. C. Suggestions TABs – Suggestion TABs appearing above the typing bar with context and relevance based personalisation is a great feature for user convenience, usage and adoption. 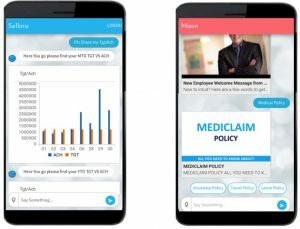 To understand these features in detail, you may click on the link below and connect with us for a demo of our HR Chatbot platform. The so called intelligence of Chatbots that a user experiences, ultimately depends on the continuous training of the BOT based on user interactions. One part of this training is, to keep parking the queries as intents which the machine does not understand and needs to be trained upon. The other part of this evolution is, to allow users to give feedback. 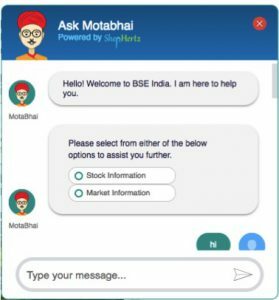 The BSE Chatbot ‘Ask Motabhai’ does not seem to have either. 5. Deliver right answers with right Data and Content rather than share page links. Chatbots are supposed to be conversational interface for all the data and content that a user would interact with without the trouble and inconvenience of finding it thru various menus and links. You ask and get it, simple. Thats’s what is expected and required to make Chatbots successful. Sending links on the chat interface neither makes it convenient nor intelligent. This is how the BSE Chatbot interacts. This is how a smart Chatbot is supposed to interact. 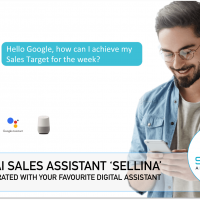 We believe that Intelligent Chatbots with even basic capabilities can help users get specific answer to their queries with data, content and insights. More importantly, over a period of time it will become magical in answering most of the customer queries. Hopefully, BSE Chatbot will quickly evolve to deliver the minimum expected user experience. In our journey of building the best AI Assistant Platform for business, we commit ourselves to keep sharing with you, all that we know. Absolutely FREE. 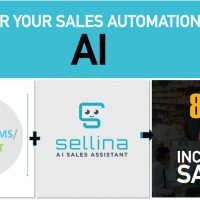 FREE AI Resources on Vendor Selection, ROI Calculation, Technology and more. 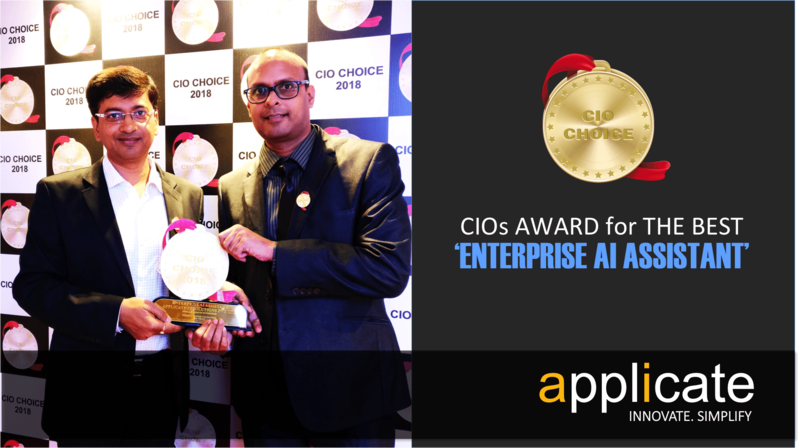 You can write to me at ranjeet@applicate.in for details on FREE A.I Resources and live demo of our Enterprise AI Assistant ‘Moon’. Welcome to an ‘AI First World’. Your next hire may well be a BOT. !! 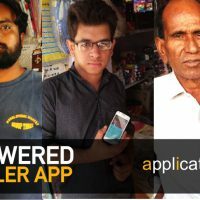 Applicate is already working with most of the top Global and Indian brands like Kelloggs, Britannia, ITC, Perfetti, GPI, Nerolac, Dulux, Whirlpool, Cryzal and others. 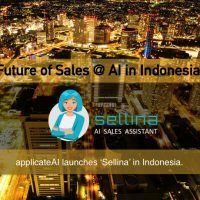 Sales BOT – AI Sales Assistant ‘Sellina’ for Sales Team and Channel Partners. Watch explainer video to know more.